Doris H. Causey, of Richmond, is the Virginia State Bar’s new president-elect. She will serve in that position for one year and then succeed President Michael W. Robinson for the 2017-18 term. Causey took office on June 18 during the VSB’s Annual Meeting in Virginia Beach. She is managing attorney of the Central Virginia Legal Aid Society Inc.’s Richmond office. She served as the VSB Council’s 13th District representative from 2009 to 2015. She is a member of the Client Protection Fund Board and of the bar’s Budget and Finance Committee. 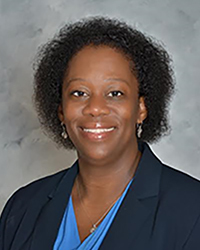 Causey also serves on the Old Dominion Bar’s Executive Committee and served as secretary of the Old Dominion Bar and the Hill Tucker Bar Richmond Chapter. She is a Virginia Bar Association Fellow, a member of the Richmond Bar Association, and a past member of the Bench Bar Conference. She is a graduate of the University of Mississippi, where she received a B.A. in mathematics and another in political science. She has a master of education degree from Tennessee State University. Her law degree is from the Thurgood Marshall School of Law at Texas Southern University. Casey’s practice focuses on civil litigation, family law, landlord tenant, foreclosure defense, and poverty law. She is married to Tracy L. Causey they have three children.